Ez egy rövid minta, mely segít a Solid Commander programot elindítani és futtatni. 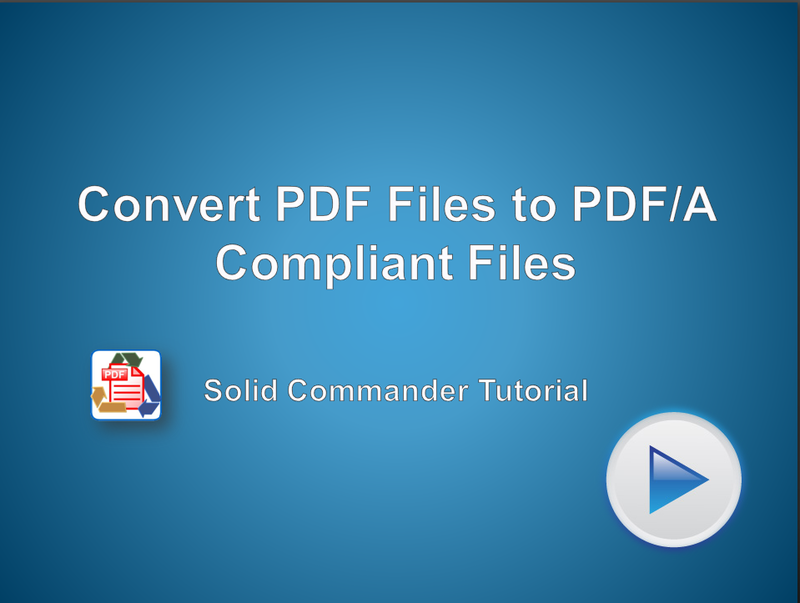 Automated Conversion of existing normal or image PDF files into fully searchable ISO 19005-1, ISO 19005-2 and ISO 19005-3 compliant archivable documents. Select Convert to PDF/A from the New Process Menu. Set the location of the following folders. You will need a Source Folder, Output Folder and Error Folder. If you want to add a Searchable Text Layer. The OCR Language for the files you are going to convert. And select if you want to Optimize the size of the created file. Click on the Status Tab. Click Start this will prompt you to Save your process with the options you have set. When you have saved your process it will Start. To Pause the process at any time click Suspend.